There were ~60 Cub Scouts and their families on this trip to nearby Chesebrough Scout Reservation. It was a fun adventure! We all got to know the Pack a little better and try some new things. 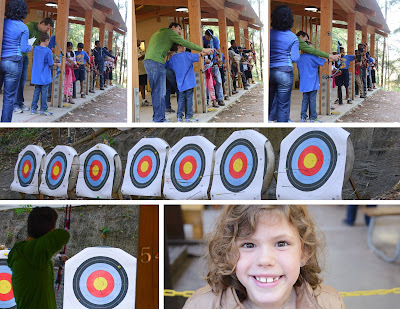 The first event for Jackson's Den was archery. It was a little challenging for our left-eye dominant, but right-handed kid. With a little help, he managed to hit the target several times. Then Ross got a turn and impressed not only his son, but the adults around too. Next up, BB guns. This event was a clear favorite for Jackson. The hand-eye coordination was a little more manageable. 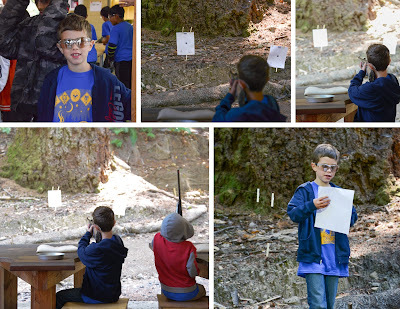 He was so scared of this event before we got there, but he really enjoyed learning how to safely and properly shoot a gun. He looks pretty cool in his safety glasses too. We all took a turn at the BB gun range, and Jackson enjoyed it so much, he went twice...once with his Den and once with the family. 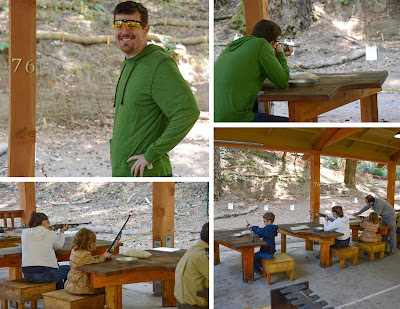 Ross, once again, wowed the adults and kids that were with us, and I was pretty impressed with myself on this one. Let's just say we're reinforcing the stereotype about people from Texas. 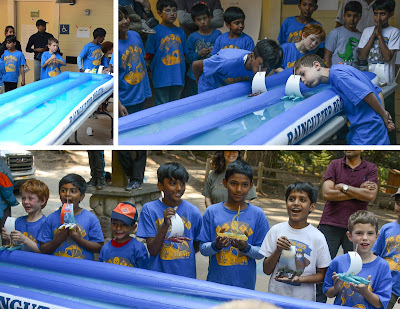 The highlight of the trip was the Raingutter Regatta though. 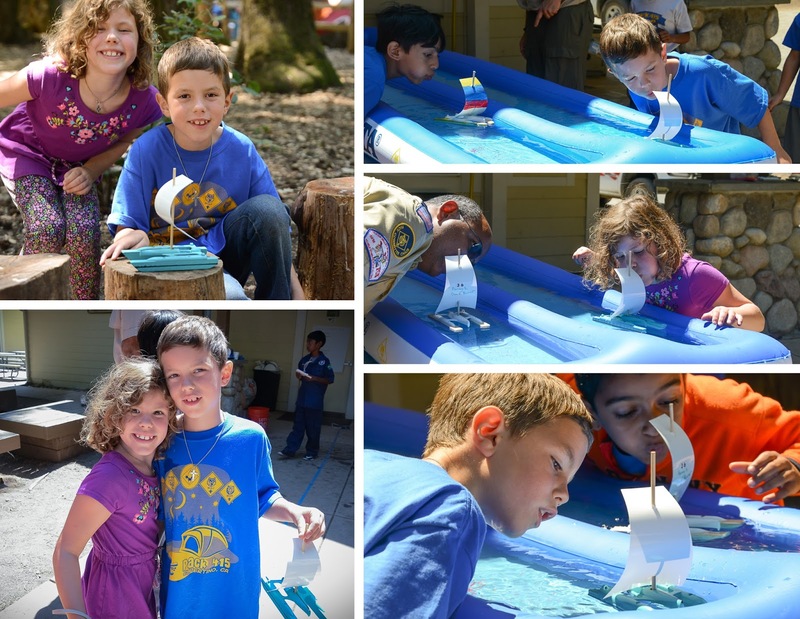 Each Cub Scout built and decorated his own sail boat and raced it against the other boys in their Den in hopes of winning a Golden Duck. The winner of each Den would race later in the day to earn the highly coveted trophy and be the best in the Pack. Jackson was looking forward to the race and was proud of his boat. He eagerly listened to the rules and advice given by the leaders. He did a practice run and then sat back and observed the others' techniques. It was a double-elimination bracket. Jackson won the first bracket and proceeded to the final round for the Den. He won race after race with some really close calls and some clear wins. In the final race his Denmate from the losers bracket beat him, which meant they raced one final time to determine the winner...Jackson won! He was so excited, but he was also a really good sport. It was so amazing to see how these kids treated each other with respect despite the competitive desires to win. Audrey was so proud of her big brother if you can't tell from the picture below! The last event of the day before the final series of races was rock climbing. Jackson and Audrey geared up and waited in line to climb. 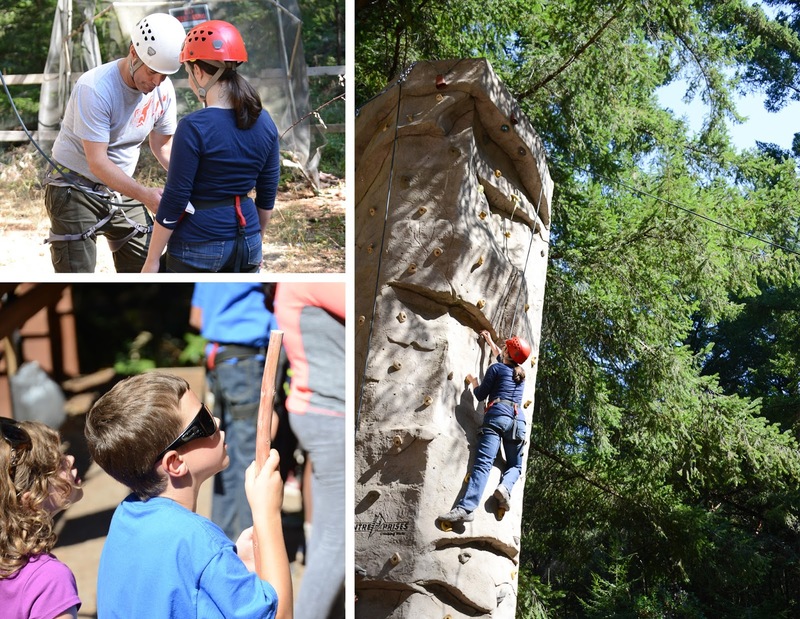 Jackson went first and pretty quickly and easily scaled the wall and rang the bell at the top. A little later it was Audrey's turn. Her agile nature made it easy for her to get to the top, but she just couldn't reach the bell. The entire crowd was cheering her on and willing her to do whatever it would take to ring the bell. It didn't happen, but she was great about it and had lots of fun anyway. There was a little extra time left when the kids were done, so they let the adults that were interested climb too. It didn't take much convincing for me to go, and I'm glad I did. It was a lot of fun and gave me some flashbacks to a fun climbing trip in high school. 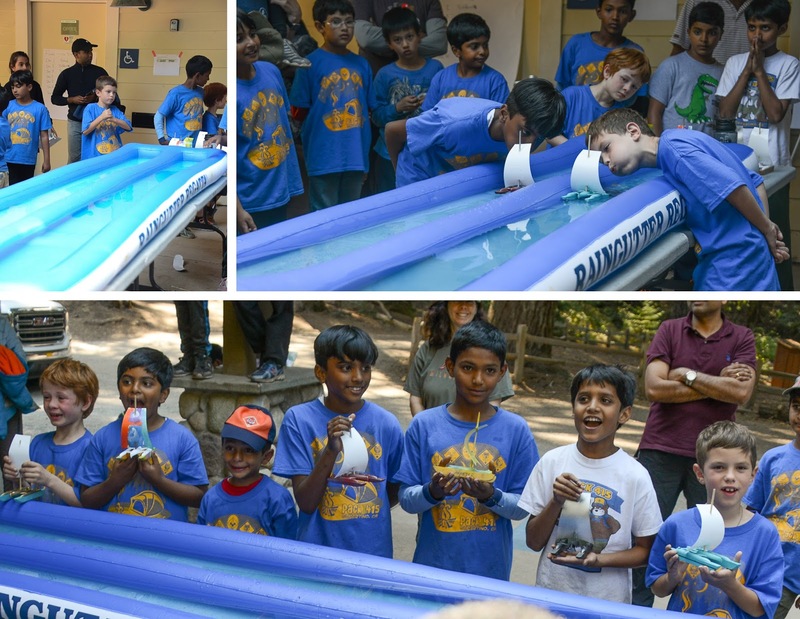 The big moment finally arrived, the Raingutter Regatta Finals! Jackson was in the zone. He was punching his hand as he mentally prepared for the final rounds...it was pretty cute! Jackson won quite a few races in the first round before moving to the loser's bracket where he got another shot at the trophy. He did so great! He didn't win the overall event, but he did REALLY well! If you check out the pictures in the album you'll see some examples of the great sportsmanship they practiced. That's where my pictures end, but that's not where the camping trip ended. That evening each Den prepared and performed a skit at the big campfire gathering. They also retired 6 American Flags that evening, which was a very humbling experience for them all. Of course, there were roasted marshmallows and campfire stories/games before bed. 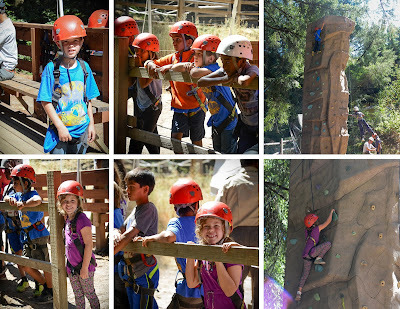 The next day the boys went for a hike, which rounded out a really fun Cub Scout camping experience!